MARBLE SHOOTERS has changed it's name to THE KINGS OF CONCRETE. The truth of the matter is to make an informed decision you need two things knowledge and choices. We can give you both. We offer over twenty years of experience. In decorative concrete we have seen it all and tried it all. We will use the experience we have gained to help you make the correct choice to fit your decorative concrete needs. From initial concrete design to color and pattern cuts. 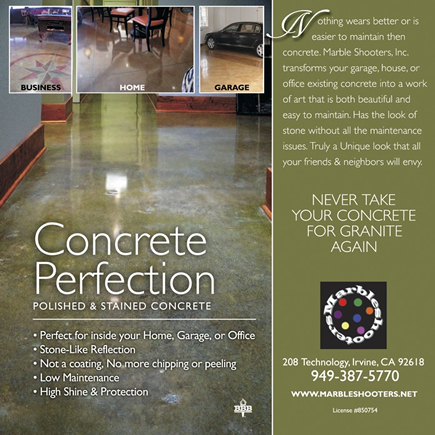 We offer the beauty and durability of polished concrete. The deep warm colors of stained and or dyed Concrete. To the durability and masking ability of coated concrete we do it all. So please check out the pictures by clicking on the icons below. If you would like a free estimate or if we can assist in answering any questions you might have. Please call or email. It is our pleasure to serve you! Not Looking for a Coating? Check out the many Diamond Polish & Acid Stain options available! Perfect for your Home, Office, or Garage. 2017 - The Kings of Concrete.